Dress For Success | Relish! We’re guilty of this at Relish! and sometimes litter up our refrigerator with so many prepared salad dressings with random expirations dating back to the days when Miley Cyrus was the media darling! 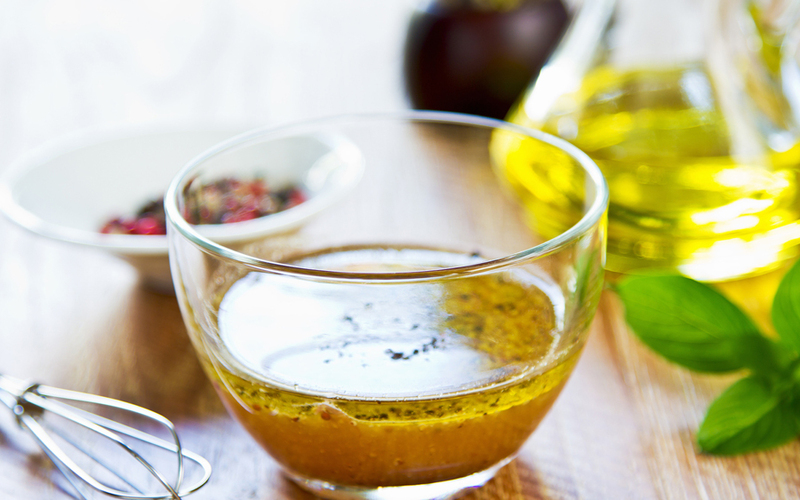 It doesn’t take many ingredients or much expense to make a darn good dressing that can be used for salads, cheeses and even tastes great as a dipping oil for bread. Here’s our favorite vinaigrette dressing that uses simple ingredients and doesn’t need to be refrigerated! We like to use an empty wine bottle with a tight-fitting cork or top and keep it on the counter with your balsamic and olive oil. 1. In a very large container, mix together the olive oil, garlic powder, oregano, basil, pepper, salt, onion powder, and Dijon-style mustard. 2. Pour in the vinegar, and mix vigorously until well blended. Store in an old wine bottle (with tight-fitting top), a mason jar or any other cool container.